TLR6 antibody is specific to TLR6. It does not recognize TLR1. Synthetic peptide corresponding to 15 amino acids near the amino terminus of the human TLR6 protein. Our Abpromise guarantee covers the use of ab37072 in the following tested applications. WB Use a concentration of 0.5 - 2 µg/ml. Detects a band of approximately 100 kDa (predicted molecular weight: 92 kDa). 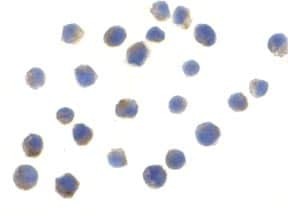 Participates in the innate immune response to Gram-positive bacteria and fungi. Acts via MYD88 and TRAF6, leading to NF-kappa-B activation, cytokine secretion and the inflammatory response. Recognizes mycoplasmal macrophage-activating lipopeptide-2kD (MALP-2), soluble tuberculosis factor (STF), phenol-soluble modulin (PSM) and B.burgdorferi outer surface protein A lipoprotein (OspA-L) cooperatively with TLR2. Cell membrane. Cytoplasmic vesicle > phagosome membrane. 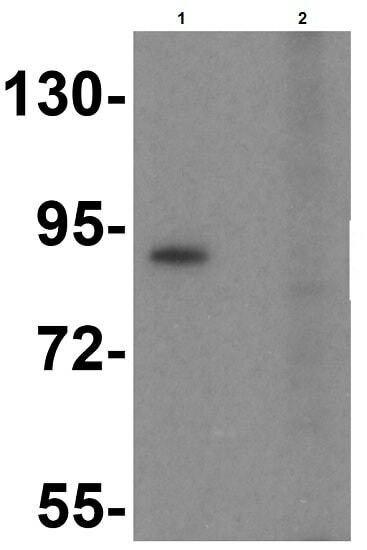 Western Blot of Daudi cell lysate labeling TLR6 with Anti-TLR6 antibody (ab37072) at 1µg/ml in (1) the absence and (2) the presence of blocking peptide..
Additional bands at: 55 kDa, 80 kDa. We are unsure as to the identity of these extra bands. Publishing research using ab37072? Please let us know so that we can cite the reference in this datasheet. There are currently no Customer reviews or Questions for ab37072.